Last year I met Matthew Paul Turner for breakfast and he was telling me about his new book, Our Great Big American God. I loved having the opportunity to sit across from him, sipping coffee, listening to him talk about this project that he was so excited about. It was fascinating to hear just a few snippets of ways that America has shaped the God narrative. Having a chance to read the final project was absolutely thrilling. Matthew has put together a great book, detailing the ways that we here in America, from the Puritans right up to today’s celebrity pastors, have molded God to fit the packaging that we need him to conform to. All of us like to talk about picking and choosing how we read the Bible and how the OTHER guys do it, but not us, and Matthew tackles that head on in his new book. I have loved Matthew’s voice since I first read Hear No Evil years ago, and while this book is obviously different from his memoirs, it still includes the wit and humor that I love about his writing. I love that he believes passionately and yet holds to those beliefs lightly. Our Great Big American God is a fantastic example of this kind of writing and this way of thinking. Regardless of your beliefs about the existence of God, or your relationship to America, this is an informative and important book. We have all of us contributed to God’s story here in America, and Matthew shows us how. 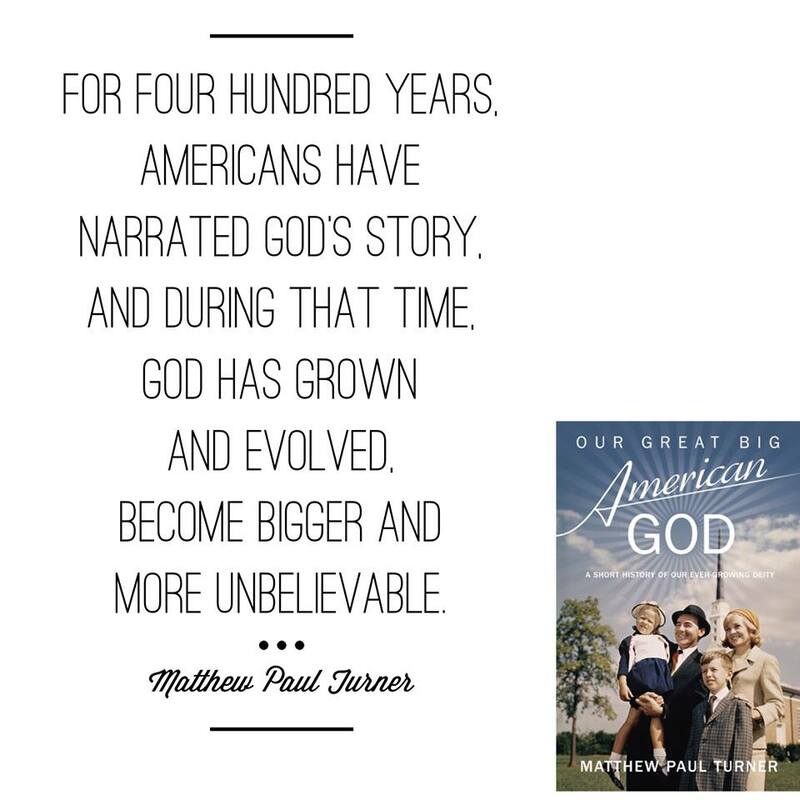 Check out Our Great Big American God by Matthew Paul Turner. This entry was posted in Books and tagged #AmericanGod, America, book review, Matthew Paul Turner, Our Great Big American God. Bookmark the permalink.